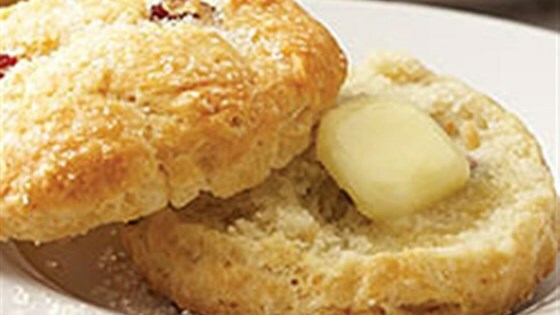 "Enjoy these versatile scones at breakfast or brunch, or with your afternoon tea." Add lemon juice to milk and let stand 15 minutes. Combine flour, baking powder, baking soda and salt. Add butter and cut into flour with pastry blender until texture of coarse meal. Stir in dried cranberries. Stir in milk to moisten dry ingredients. Roll out on a floured surface to 1/2-inch (1 cm) thickness. Cut into 2-inch (5cm) rounds or squares. Sprinkle with granulated sugar. Bake in the preheated oven for 12 to 15 minutes. For a quick breakfast on the run, grab a scone, slice it in half and add a slice of cheese and fresh fruit preserves ? blueberry, cherry or pear. Overall, pretty good scones. The dough was very loose and definitely had to be kneaded several times. These scones were so easy and quick to make that I was done in about 30 minutes start to finish. They were light, fluffy and not overly sweet. A winner at our house! Added lemon zest as others suggested. Everyone loved these. Served with Devon cream from this site. My mom said they were better than the local bakery scones we love. Very good. I added lemon zest and some almond extract to liven it up a bit.